So that is exactly what I did. I created a space for reflection. Making my new year’s resolutions and creating my theme for 2013 (12/31/12 post), I realized I needed a special place where I can center myself, be calm, feel safe – and get on my yoga mat every day. My writer friends have special places where they write. I needed a special place to find the courage to do the writing, to feel the motivation to make the music, to hear myself sing loud and sing proud, “I Believe.” I needed a place to reflect. One person in the article created her space on the floor of her bedroom, another guy used the inside of a fireplace. 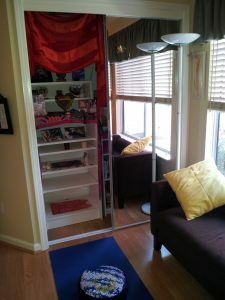 I chose the inside of my closet in my office where I can open and close the space as needed. It took a little consolidating and some pre-spring cleaning, but I managed to make a space I now call home to my meditation, source of creativity, heart center and reflection. With closet door closed, time for work.